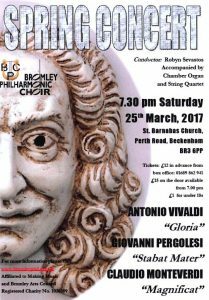 On Saturday 25 March 2017 the Bromley Philharmonic Choir host their Spring Concert at St Barnabas, including Vivalda’s Gloria, Pergolesi’s Stabat Mater and Monteverdi’s Magnificat. Tickets are £12 in advance from the box office: 01689 862 941, or £15 on the door from 7pm. Under 18s are £1. 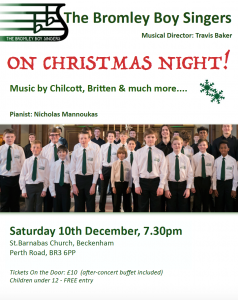 On Saturday 10 December at 7.30pm, St Barnabas welcomes the Bromley Boy Singers for On Christmas Night! Tickets on the door are £10 (including an after-concert buffet). Children under 12 – free entry. 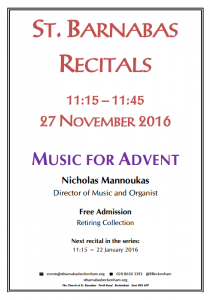 On Sunday 27 November 2016 at 11.15am, Director of Music and Organist at St Barnabas, Nicholas Mannoukas, will give an organ recital entitled “Music for Advent”. Admission is free, with a retiring collection. The next recital in the series will be on 22 January 2016 at 11.15am. 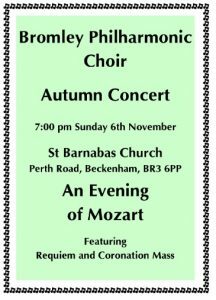 On Sunday 6th November at 7pm, the Bromley Philharmonic Choir host their Autumn Concert, An Evening of Mozart, at St Barnabas. It includes his “Requiem Mass in D Minor” (K. 626). This was composed in Vienna in 1791 and left unfinished at the composer’s death on December 5, with a completion by Franz Xaver Sussmayr the following year. The Choir will also be performing Mozart’s “Coronation Mass in C Major” (K. 317), completed in 1779 in Salzburg, after Mozart’s return to the city and “Misericordias Domini”, written four years earlier when Mozart was only nineteen which is considered a minor masterpiece.